Happy Independence Day to all my fellow Indian friends!! My daughter is having really bad tooth ache, she needs to gets some dental work. She is in another dose of antibiotics. I don’t like pumping antibiotics but now I have no choice, within a month time she is on third round of antibiotics. Hope once she gets this dental work done it will be fine. Poor girl can’t enjoy mama’s cooking. She is gone back to rice and soup. She was able to try few pieces of biscotti. I told her I will make it again for her once her tooth is fine. As it is 15th of month, we are going to reveal this month’s baking partners challenge, this month we try to make cookies from various parts of world. Since world is so big it is not easy to finish it in one challenge, so this time we did choose, Speculoos from Dutch, Kourabeithes from Greece, Biscotti from Italy, Chinese almond cookies from China. 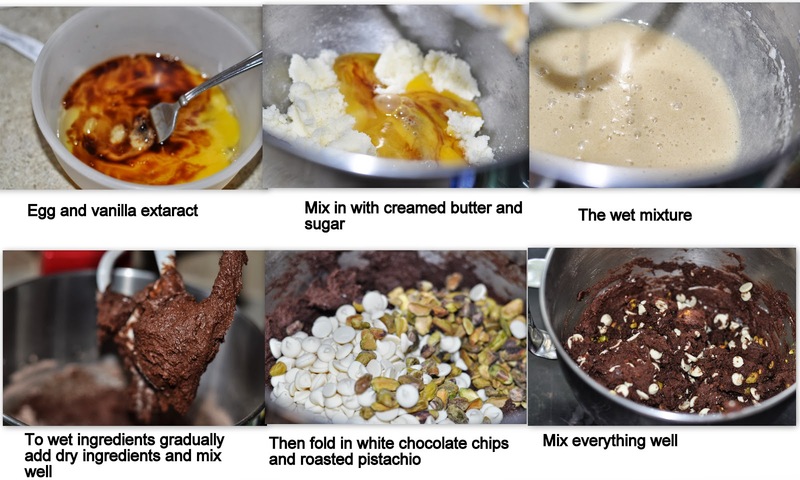 Sowmya of Nivedhanam blog suggested Speculoos and Kourabeithes. 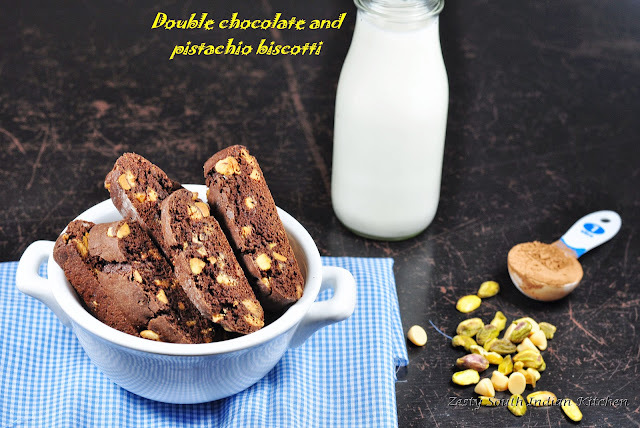 Biscotti recipe was suggested by Sandhya of My cooking Journey. And finally Chinese Almond cookies were suggested by Suja of Kitchencorner try it. Since I tried GevuldeSpeculaas and Mexican wedding cookies earlier which are similar to Speculoos and Kourabeithes. I tried double Chocolate biscotti. Biscotti is in my do list for long time. I didn’t get the time to do. Finally through this baking partner challenge I was able to get an opportunity to do the biscotti. I wanted to try Chinese almond cookies too, but not got much time to finish it. So I have reserved it for next time. In Italy, biscotti is the name for all cookies, if you really want a biscotti what we are talking about, you need to ask them for biscotti di Prato (English: Prato biscuits), also known as cantuccini(English: coffee bread) or biscotti. They are twice-baked biscuits/cookies originating in the Italian city of Prato. 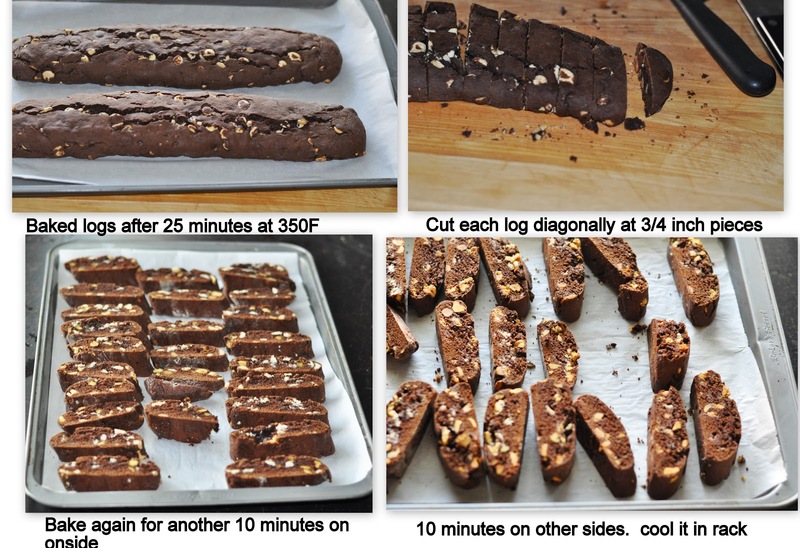 Biscotti are made with the cookie dough rolled into logs and baked once. They are then sliced diagonally by hand and baked once again to make them firm and crunchy. Traditional version is made with anise and almond, however you will able to find other version too like chocolate, cherry etc. 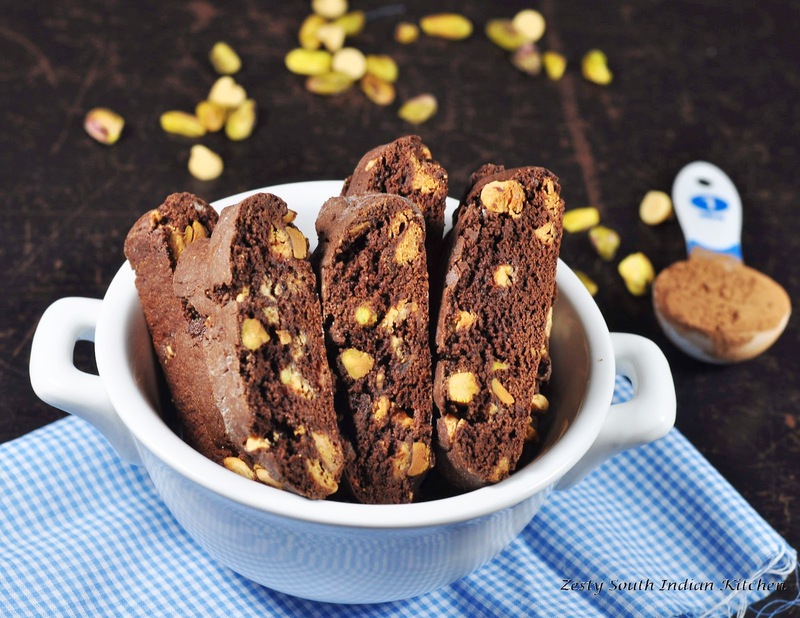 According to history, biscotti were carried by sailors on their long voyages. As it is twice baked it is resistant to mold, and you can store them for 1-2 months without spoiling. It is usually eaten by dipping in coffee or cappuccino, or in a special Italian wine known as Vin Santo read more from here. It has a long history, and first originated in the Roman times, and then it was re-inventedin basic almond recipe of Tuscany, flavors later expanded to anisette, amaretto and lemon-flavored dough; to other spices; to biscotti with raisins and other dried fruits; to biscotti studded with chocolate morsels and with other varieties of nuts. Nowadays, the flavorings are only limited to the imagination of the bakers and you can incorporate your favorite flavors to make this treat. Since my kids are lovers of chocolate and chocolate cookies, I decided to make chocolate biscotti; I used the recipe of Dorie Greenspan’s baking from my home to yours. First thought of doing substitution, then my hubby told me try it first without modifications and to stick to the original recipe and see how it turns out, if it is good then add your innovations. However chef in me made little changes, by substituting pistachio and white chocolate chips. If you have flour, butter, cocoa powder, chocolate chips, nuts of your choice, sugar and egg then you are good to go. 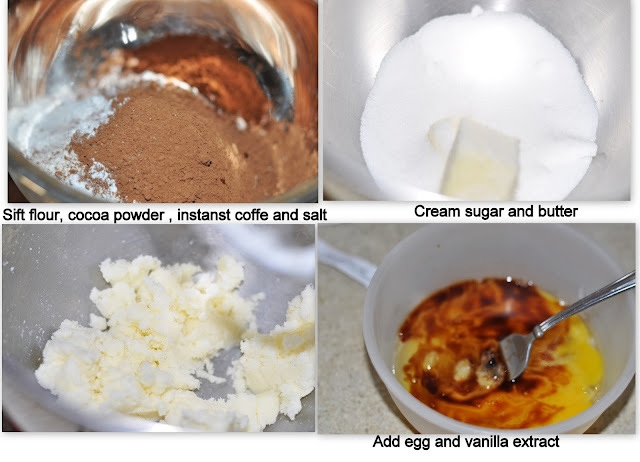 You can make this delicious treat for your coffee. Mine turned out be delicious. Trust me if you love chocolate cookies, then give it try it won’t disappointment you. Please make sure to take your little time to see the creations of rest of baking partners, as each one has its own delicious stories and end results. If you also an enthusiastic baker, who love baked goodies, and willing to bake with us shoot me an e-mail favoriterecipes12 (at)gmail(dot)com. Come and join and have fun. In a bowl sift together the flour, sugar, cocoa, coffee powder, baking soda, baking powder, and salt. In a bowl of kitcheaid stand mixer, cream the butter and sugar on medium speed about 2 minutes. Scrape down the sides of the bowl and add the eggs and vanilla; beat for another 2 minutes. Decrease the speed to low and mix in the dry ingredients in 3 additions, mixing only until a dough forms. Scrape down the sides of the bowl and mix in the chopped nuts and chocolate chips. 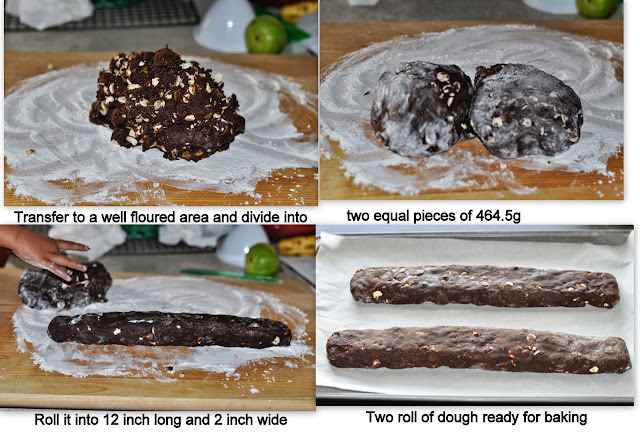 Turn the dough (around 929g) out onto a well floured work surface and divide in half of around 464.5g pieces. Knead each portion a few times to pull the dough together into a ball, then shape each portion into a 12 x 2 inch log. Place each log on the baking sheet. Bake for 25 minutes. Remove the sheet from the oven and let it cool on a rack for 10 minutes. Then, slice the logs diagonally into 3/4-inch thick slices and leave the slices standing up on the baking sheet. Return to the oven for another 10 minutes of baking on one side and remove from the oven and flip and bake the other side another 10 minutes. Transfer biscotti to a rack to cool completely. Store it in an air tight container for 1-2 months. Adapted from Dorie Greenspan’s book Baking: From My Home to Yours. They look fantastic! I love both chocolate and pistachios! I can’t wait to try it. Don’t worry she will be fine after her dental repair. Biscotti looks delicious. 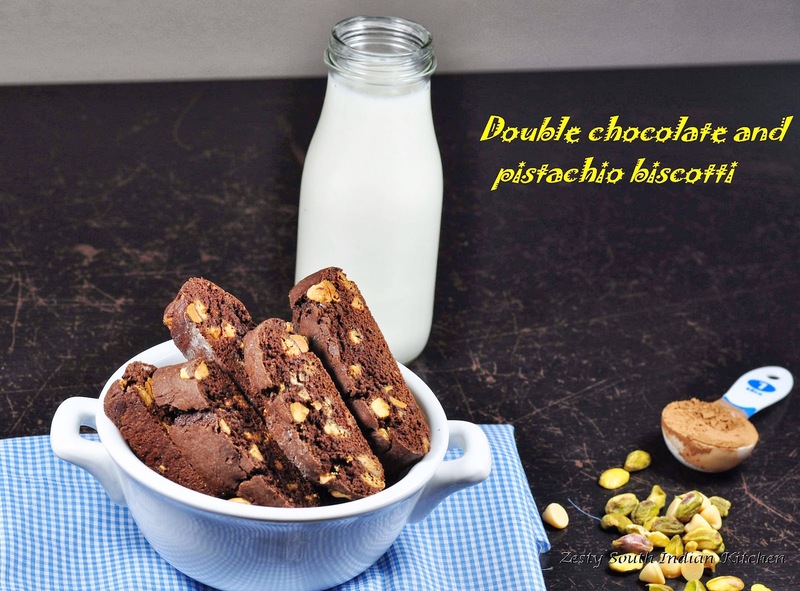 double chocolate biscotti looks awesome,take care of ur daughter’s teeth. 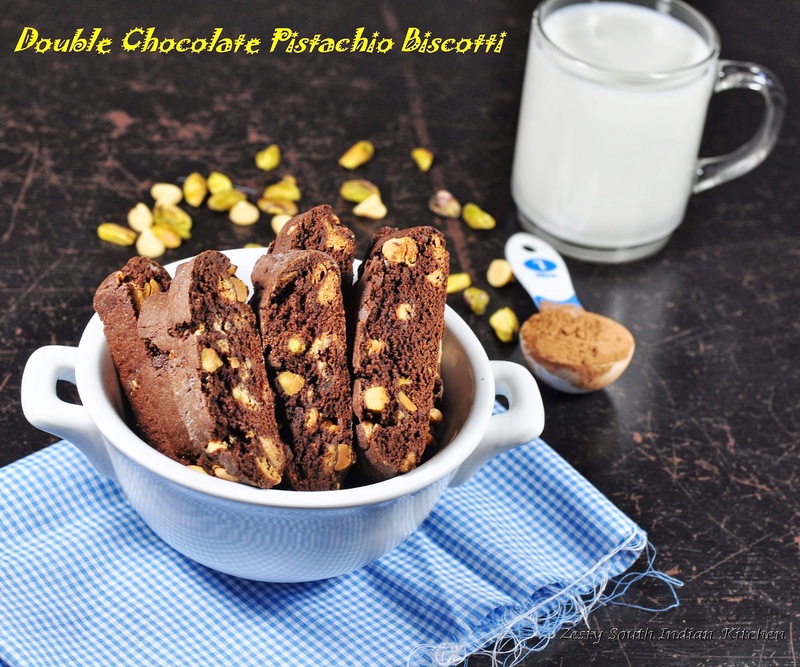 Wow..biscotti looks so perfect and delicious. Chocolate and pistachio is a wonderful combination, looks perfect. These are beautiful, Swathi!! The pictures are very tempting! perfectly done,Swathi…very very tempting. Liked your fb page as The Pick’y Bank. superb biscottis, have come out perfect…. Looks very yummy & inviting.. Awesomly done Swati ! Hi Swathi, your biscotti look so tempting and awesome. Thanks for sharing your recipe. Very well bake and love your presentation. Nice click. so tempting. They look so perfect and delicious. Must try the recipe. Love biscotti, like your step by step intructions. Good one. They look very delecious Swathi! Oh man do I love biscotti, this recipe sounds awesome. Thanks for hosting the link party, always appreciate it! Swathi – You did a fantastic job on the biscotti. Love the flavor combination. What wonderful biscotti with pistachio and white chocolate! Love that combo Swathi! These make the best treat for dipping in coffee and tea. Delicious and perfectly made biscotti. Perfectly done, looks too good..
Biscotti looks fabulous! Would like to munch now.. Bookmarked it!